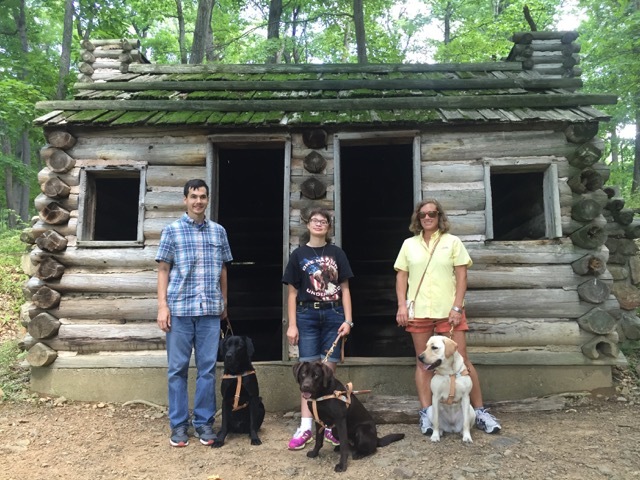 Classmates Preston and Rebecca with their new dogs, and myself and Hugger (right) in front of a commander’s cabin at Jockey Hollow State Park. The last week at school was busy, with a lot of “country” work, and some indoors training. Hugger has proven to be as amenable to country roads and hiking trails as to the city. 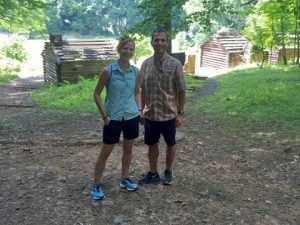 We cruised along suburban roads with curbs but no sidewalks and rural roads without any shoulder (she’s trained to stay to the edge of the road). 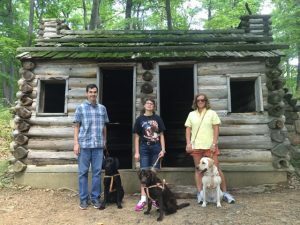 We went for a hike in Jockey Hollow State Park, and, to add a little history to our schooling, we visited some of the replicas of huts Washington’s army used during the Revolution. I’ll need to walk along similar roads to get the bus to work, so this has been perfect practice. We also checked out several coffee shops (one of my top priorities, smile), grocery stores, revolving doors (not easy with a dog next to you! Hugger goes on the outside), cafes, and department stores. 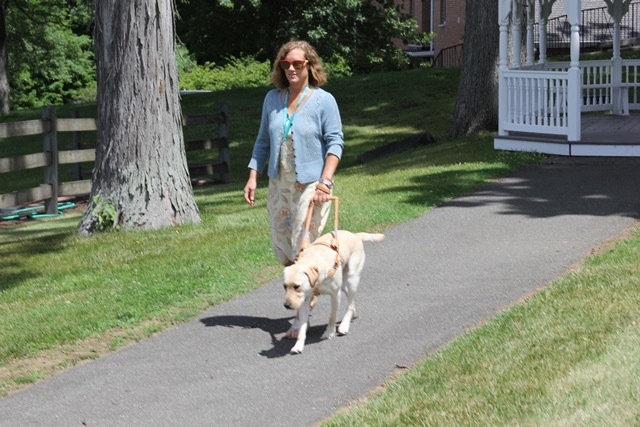 And ice cream shops (yum) – I’ll need to continue lots of walking at home to work off the extra pounds. The work in restaurants and shops will help when traveling, since Hugger will know what to expect when we get inside, and how to get seated under or next to a chair. And I’ll have practice making sure she doesn’t try to clean the floor. We also went to the courthouse and practiced going thru the metal detector. Important training for airports … and, if I ever do end up in the penitentiary (where Hugger already has experience), we’ll know how to start that journey.